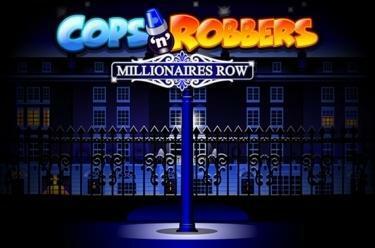 Play Cops ’n’ Robbers™ Millionaires Row online for free now! Round two of our wild villain hunt: 20 win lines, a robber, a cop and more gold than you have ever dreamed of! Open safes, grab the precious metals - but make sure that you’re always faster than the cops! If you manage to crack the code, millionaires row will lie at your feet! Countless Free Spins, crazy wild symbols and - if luck is on your side - a grand jackpot! Your goal: five matching symbols along the 20 win lines! Recreate the win lines running from left to right across the reels - if you land 3 matching symbols without interruption, luck's your partner in crime! The Guard Dog substitutes all symbols except for the Robber. 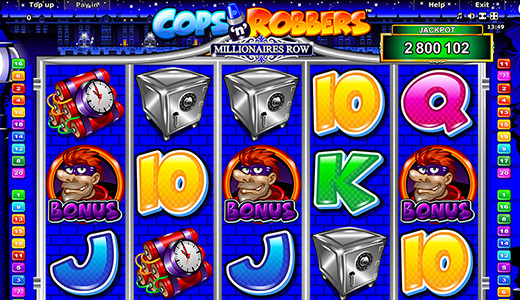 Gold bars and cops can appear in groups and increase your winnings. Rewind: One or more reels rotate back a few positions and land a win. Fast Forward: One or several reels can turn forward a few spins and land a win. Bonus Wilds: You gain further Wild symbols that are added to the reels - the more Wilds, the more chances to win! 3 Robbers in any position on the first, third and fifth reels will trigger the Street bonus. A game board appears, you roll with ‘Start’, and your character moves forward the number rolled. Each field holds a win for you! Free spins or Wild bonuses for the Free Games that then take place! If you land a villain on ‘Start Free Spins’, the bonus game ends. You now start the Free Game with the Free Spins that you have won. The Street bonus can be redeemed in the Free Games. You can collect Gold Keys in the Street Bonus game and the Free Games. 5 Keys win the jackpot If you, e.g. have held 3 Keys in the Street bonus and you land 2 further Keys in the Free Games, you can look forward to a big win! In the free games, the Keys are placed on regular symbols on the fifth reel. If these symbols are also part of a winning combination, they win as usual.